The colorful Scroll Coral is one of the most unique Tubinaria species, and is also one of the hardier ones! The Scrolling Tubinaria Coral Turbinaria reniformis is one of the most recognized of the Turbinaria genus. In mature specimens, their scroll-like or whorled shape can be either vertical or more horizontal, depending on the depth in which they are found. Specimens found at deeper levels have a plate like or flatter, horizontal appearance. That can change to a scroll like, upright shape in shallower water with brighter lighting. These characteristic Turbinaria shapes are reflected in some of the Scroll Coral's other common names like Vase Coral, Turban Coral, Scrolling Turbinaria Coral, and Yellow Lettuce Coral. The Turbinaria species take on various characteristic shapes, depending on the depth at which they are found. Their shapes include vase, plate, and columnar, yet they are quite adaptable. They will robustly change shape with a change in environment. If one were to transplant a shallow dwelling species to deeper levels, or visa versa, they will actually change shape to make the most out of the lighting in each habitat. Besides having various shapes, Turbinaria corals also have variations in their polyps. One side of any plate or column generally has polyps or at least tissue coverage. The color of the Scrolling Coral T. reniformis is usually a yellowish or greenish brown, usually with yellow polyps and a yellow edge. Some Scroll Coral specimens you may see in stores may not have as many polyps, due to lack of feeding, yet the polyps are still distinctly small and spaced, and so it is easy to identify. The Turbinaria corals are much sought after for reef aquariums. Depending on the variety, Turbinaria species can be grouped as small polyp stony (SPS) corals or as large polyp stony (LPS) corals. The Scrolling Turbinaria Coral T. reniformis has smaller polyps with calices (opening of the corallite) that are only 1.5 to 2 mm diameter. Yet they are most often grouped as an LPS corals, though you can find it occasionally listed as an SPS coral. Either way, the Turbinaria polyp expansion is a great indicator of the overall health of the aquarium, thus a great addition to most systems. The Scroll Coral is fairly easy to maintain in an aquarium with good lighting and water quality. They are mostly friendly towards other corals, making them a popular choice with all levels of reef enthusiasts. They do have polyps, that when irritated can produce a hefty mucus net. If this mucus comes in contact with other corals, it can damage them. They have been known to reproduce in captivity, and captive bred specimens are generally more healthy and easier to maintain than wild caught. This is a perfect specimen of T. reniformis or the Yellow Scroll Coral! They make up a unique form that can actually change depending on water flow and light. Make sure you use a turkey baster to blast away sediment to prevent infections. And his cool accent makes it easy to listen as well! The Scroll Coral Turbinaria reniformis was described by Bernard in 1896. Other common names they are known for are Vase Coral, Scrolling Turbinaria Coral, Turban Coral, Yellow Scroll Coral, Yellow Lettuce Coral, Yellow Turbinaria, and Bowl Coral. Turbinaria corals have been reproduced in captivity, and there are plenty of captive grown corals to choose from. Captive bred specimens are generally more healthy and easier to maintain than wild caught. Where Turbinaria Corals Are Found: The T. reniformis are found in the Red Sea, Indo-Pacific Ocean , Indian Ocean Australia (excluding most of the south coast) and the east coast of Africa. Turbinaria Coral Habitat: The T. reniformis are found at depths from 0 to 131 feet (0 - 40 m) in shallow reefs, rocky foreshores, and lower reef slopes. Status The T. reniformis is not on the IUCN Red List of Endangered Species. Description What do Turbinaria Corals look like: The T. reniformis has a lightweight skeletal structure and there are a variety of shapes, depending on the depth where they are found. Mature specimens are generally deeply scrolled or deeply cupped. Especially those found in shallower waters with brighter lighting will develop the scroll-like, upright shape. These corals also tend to be in areas of high water movement, which causes the convoluted shapes like the "scroll" and vase shapes. The deeper dwelling T. reniformis typically have a have a plate like or flatter, horizontal appearance, so all available light is utilized. Their colors can be a yellowish or greenish brown, usually with yellow polyps and a yellow edge. The Scroll Coral has polyps that can capture and eat larger foods. The polyps use mucus secretions to both capture food and get rid of waste. Their polyps are smaller and tuft like, with plenty of space in-between. 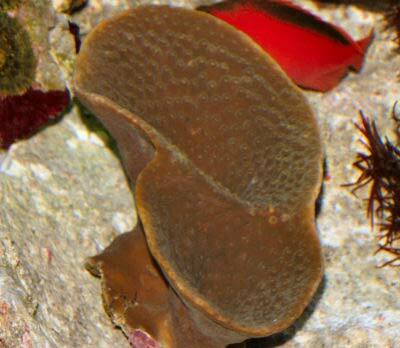 They sit on small corallites, with calices (opening of the corallite) that are only 1.5 to 2 mm in diameter. The polyps can be yellow to yellowish brown. Some coral you may see at the stores may not have as many polyps, due to lack of feeding, yet they are still distinctly small and spaced as far as the polyp is concerned and easy to identify. The T. reniformis can grow up to 3 feet (91 cm) across. Juveniles are generally shapeless, yet conform to water and light availability. Their life span is unknown. Difficulty of Care Turbinaria Coral Care: The Turbinaria genus is fairly easy to maintain in an aquarium with good lighting and water quality. The T. reniformis is one of the easier species to care for, as are most of the deeper dwelling Turbinaria, being less demanding of light and water movement. Because the T. reniformis are usually thin and deeply cupped or folded, they require brighter light and surging water movements to keep their folds and curves free of debris. You can use a turkey baster if needed. Their polyp expansion is a great indicator of the overall health of the aquarium. In captivity, although the Scroll Coral relies on lighting for their zooxanthellae, they also need to be fed a variety of other foods. Feed such foods as mysis shrimp, enriched baby brine shrimp, cyclopeeze, and finely minced silversides or other fish from the ocean that you can get at your grocery store. They need to be fed several times a week. Use good sense in determining how often your particular animal needs food. If their polyps start to disappear, then you are not feeding them enough. Aquarium Parameters A live rock/reef environment with a sandy substrate is what is needed for your Scroll Coral, along with some fish for organic matter production. A mature tank is recommended. Be sure to have proper water movement and provide sufficient lighting. Turbinaria species can be tolerant of several lighting conditions, though a moderate to high light is preferred by the T. reniformis. Along with adequate lighting, provide a moderate and turbid, or a surging water movement for the best health. This is a peaceful species, but other corals may not be, so provide adequate space between species. Compatibility and Social Behaviors The T. reniformis is peaceful towards other corals. However, if their polyps become irritated, they can produce a hefty mucus net. If this mucus comes in contact with other corals, it can damage them. So they do need adequate space between themselves and other corals. Scroll Corals do well in a mixed reef, a small polyp stony (SPS) coral tank, or a large polyp stony (LPS) coral tank. They do need to be kept away from contact with polyps of Zoanthid corals, and away from the sweeper tentacles of other corals. They are safe with reef safe fish, yet do not like to be walked on, sat on, or otherwise pestered by any kind of crab. In captivity, propagating the T. reniformis is fairly easy through fragmenting. Coral farmers may use sexual reproduction to propagate in the future, as it has been successful. Potential Problems The T. reniformis are attractive and durable when their needs are provided for. They have mucus secretions that they use to capture food or get rid of waste. The only time an aquarist should worry is if the actual tissue looks unhealthy under the mucus. The species can be scrolled and convoluted. Keep their folds free of detritus, food and algae with good water flow and a periodic blast of a turkey baster to get into the crevices. Availability Turbinaria Corals for Sale: The T. reniformis is very easy to find at pet shops and on line. Online they can run about $20.00 USD or more depending on size and/or color.